In this digital era, security is a big concern, your personal information such as credit card details, photos, videos, contacts, relations, Geo-info and almost every other personal information is on your device or saved online. Although this makes things quite convenient, it also raises risks of information getting stolen. Security issues have been handled quite well on the PCs, but many people don’t care about security on the smartphones. This makes them even more vulnerable and easier to compromise. If you are an iPhone user, then there are many ways to protect it and make sure your data is secured. Apple added many different ways to ensure there are no iPhone security issues. However, not all of these features are enabled by default and some features may even need to be disabled to offer protection. To help you make sure your iPhone is safe, we are going to list down some easy iphone security tips to secure your iPhone easily. Just give few minutes of your precious time to your iPhone to make it more secure.. Note: In most case, security always comes by sacrificing convenience. So you should be ready to make things a little inconvenient to ensure everything is safe. Password protection is the most basic yet powerful feature of iPhone. It will ensure your phone doesn’t get accessed by anyone else if it unattended. 4 digit PIN code offers good security, but a lengthy strong password offers a way better security. You can add a strong password with alphabets, numbers, and characters to ensure no one could guess it. You can find the options to add a password under “Settings” > “Passcode”. Also, enable “erase data” feature there, so if anyone tries multiple times (10x) to enter your phone, all data will be erased. It can be handy to protect data, but may also accidentally delete your data. Now that you have a strong password to prevent unauthorized use, it is important to ensure your device stays locked when you are not using it. Pressing the power button to lock your phone is good, but there are times when you will miss pressing the button and leave your phone open. If Auto-Lock feature is enabled, your device will automatically get locked after a specific time. So even if you left your phone somewhere, it will still get locked. To enable auto-lock, go to “Settings” and click on “Auto-Lock” under the “General” tab. There you can also define how much time the device should wait before auto locking. iPhone comes with the ability to show notifications like messages, calls, and apps notifications, etc. right on the lock screen. You don’t need to provide a password to access this information, everything will be displayed right on your screen. This feature might be very convenient, but it also reveals all the information without any kind of security to protect it. You can turn off this by going to “Settings” > “Passcode” and you will find the settings to disable lock screen notifications under “Allow access when locked” heading. While you are there, you should also disable Siri to prevent its access from the lock screen. Normally, when you access a website that you have accessed before, you won’t have to enter any login details as your browser auto-fills it for you. It offers quite a convenience to just tap two times to login to your desired website. However, it also raises a huge security risk as anyone can access these websites if they get their hands on your iPhone. So your best bet is to turn-off auto-fill option in your browser and manually enter login details every time. This is quite inconvenient, but it also secures your access to different websites, including financial based. You can search instructions for your specific browser on the web. Jailbreaking your iPhone might seem like an intriguing decision, but it also comes with many security risks. As you gain root access to your iPhone, you also breach all the security walls created for you by Apple. So any app can easily access your phone and even gain full access to its system, leading to potential harm. There are some vulnerabilities that are only created to damage jailbroken iPhones, so there is a chance you could be a target of them. Furthermore, you can download any malicious application without any warning or protection from Apple, which will damage your phone and may even compromise your personal information. You can add two-step verification to your Apple ID and iCloud for double security. If it is enabled, anyone will have to authorize access to Apple ID through another device using a 4-digit code. This will secure all your payments and access to your data available in iCloud. If you will make any purchase on the App Store, iTunes or iBooks, you will first have to complete the two-step verification to do so. You can go to “Manage your Apple ID” page to add two-step verification to your Apple ID. Apple has a free app called “Find My iPhone” to track down lost iPhones, you can set it up to ensure you get to recover your device in case it gets lost. If you have a iPhone running iOS 5 or above, then you can download Find My iPhone app from the App store to get started. You will have to log in to Find My iPhone with your Apple ID and set it up. Make sure it is enabled all the time, so when your phone gets lost/stolen, you will be able to recover it. The app uses GPS tracking to track location of your iPhone, so it must have the required access to be tracked. This is a bit of a hard to gulp recommendation, but it is better to turn off iCloud auto sync to ensure no important personal information gets synced. Deleting any data in your phone that is synced to iCloud will not be deleted and can be accessed from any device, thus, increasing risk of getting it stolen. You can manually sync data as you please, to ensure only the data you want to be synced is being saved in iCloud. You can easily turn off auto-sync by going to “iCloud” option inside the “Settings”. The option can be re-enabled any time in the future if you change your mind. While installing, applications ask for different permissions to access different data of your phone. Some apps may not require any deep access, but there are many apps that require access to your location, messages, contacts, photos and other private data to work properly. If you are not comfortable with these permissions, you can just decline them. However, if you will limit access of apps, they will also not be able to provide all their features as you have limited their access. So you need to decide wisely whether you are willing to sacrifice personal information for added features or not. You can decline app access while installing them or going to “Privacy” option in the “Settings”. How to : Protect Your Privacy on the Internet with Private Photo Sharing ? 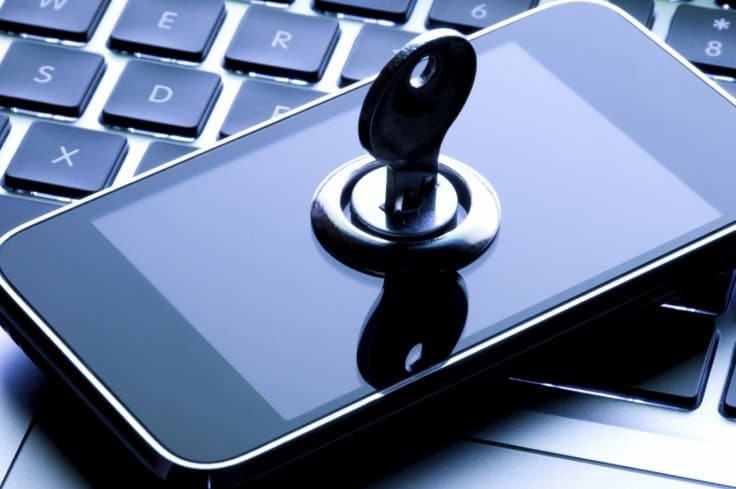 The security of your iPhone is of utmost importance, you need to make sure your iPhone data is safe. Using some built-in security features and having a little precaution, you can secure your iPhone easily. Just follow the tips mentioned above and make sure your iPhone is secure from any unauthorized access. It might be a bit inconvenient to do many things manually for the sake of security, but it is all worth it if you are concerned about the security of your iPhone. If you have any other good tips to protect iPhone, let us know in the comments.